Bratislava is the capital and largest city in Slovakia. It's at the administrative, cultural, and economic heart of the country and has become a popular place to visit. The city has a nice medieval inner city that has narrow streets and quaint shops. There's a castle by the Danube River and many historic buildings spread throughout. There are two main squares to the old town that have interesting architecture and character. 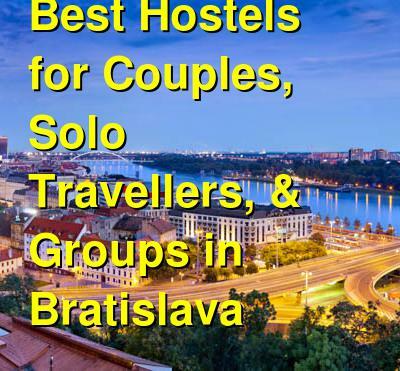 There are many great hostels to choose from in Bratislava. They range in style and personality, so whatever you're looking for, you're sure to find. How much do hostels in Bratislava cost? Hostel Folks is a great place to stay if you want a traditional hostel that is still quiet enough for you to sleep at night. It's conveniently located near the downtown pedestrian zone and is centrally located near many of the city's top sights and attractions. St. Michael's Gate is just across the street from the hostel and from there you can walk into the historic center. This is also a popular nightlife area. The hostel has a cozy atmosphere and several great common spaces. Many guests enjoy hanging out in the common areas or watching television on the flat screen tv. There are also video games available and public computers. The hostel also has a shared kitchen which guests can use to prepare their own food. Private rooms are either doubles, triples, or quads. All have shared bathrooms. Dorms sleep either six or eight people and female only or mixed dorms are available. A good hostel for solo travellers, couples & small groups. Hostel Blues is one of the most popular hostels in Bratislava. It's conveniently located in the downtown area and there are many great restaurants, museums, pubs, and shopping areas nearby. You can also walk to most of the city's top sights and attractions. The hostel has a social environment where it's easy to meet other guests. There's a bar on-site that is open all night and there's usually a local band playing once a week. The hostel has all of the standard amenities for guests including wi-fi, comfortable couches in common areas, and a full kitchen which guests can use. There's also a library where you can borrow books, board games, or a deck of cards. The hostel has both private rooms and dorms available. Private rooms are either doubles, triples, or quads. Dorms sleep either four, five, six, eight, or ten people and female only or co-ed rooms are both available. Wild Elephants is conveniently located in the historic city center. Location doesn't get better than this. The hostel is manage by travelers so they have a passion for what they do. They know the area, but they also know what travelers want and need in a hostel. The hostel organizes a variety of events for guests including pub crawls and walking tours. The hostel has a social environment and it's the place to stay if you want to meet other young travelers. The hostel specifically requests that there be no groups larger than four. This helps keep the communal and social environment that they thrive for. The also encourage guests to hang out and prepare meals together. If you're traveling alone, then this is the place to stay to meet other guests. They also offer all of the standard amenities including wi-fi throughout. There are no private rooms in this hostel. Dorms range in size with rooms as small as four beds and as large as 10 available. Art Hostel Taurus is another fun and social hostel in Bratislava. It is conveniently located just above the Old Castle in the heart of the historic part of the city. The Old City Center is just a minute's walk away. The hostel has a mellow and fun atmosphere where guests like to hang out and enjoy music. There is even a stage and a variety of music instruments that you can borrow. There are also several common areas where you can relax, read, or just chat with other guests. The hostel is small, with only eight rooms available. Private rooms are twins triples, and quads. Dorms sleep four, five, six, and eight people. Breakfast is available and included in the price of the room. There are also laundry facilities, public computers, a refrigerator, microwave, and other games and amenities available.